In contemplating this question, I see the WSJ has an interesting piece out this AM on this very question. One factor in play they note is that China’s share of our sovereign debt has fallen by half, from 14 to 7 percent. That reflects both China’s decline in dollar reserve holdings, and more internal investment. Also, the piece notes the role of the stronger dollar and the resulting increased price of holding dollar assets. The fact that Treasury yields remain low confirms that part of the story. Also, as Krugman and others have maintained, it just doesn’t make a ton of sense that countries with large dollar holdings would undertake actions, like dumping US debt, to debase their holdings. And, if they did, the cheaper dollar would make our exports more competitive. So, while I worry more about our weird, upside-down fiscal stance right now than most progressives, the declining trend at the end of the figure above doesn’t give me too much pause. 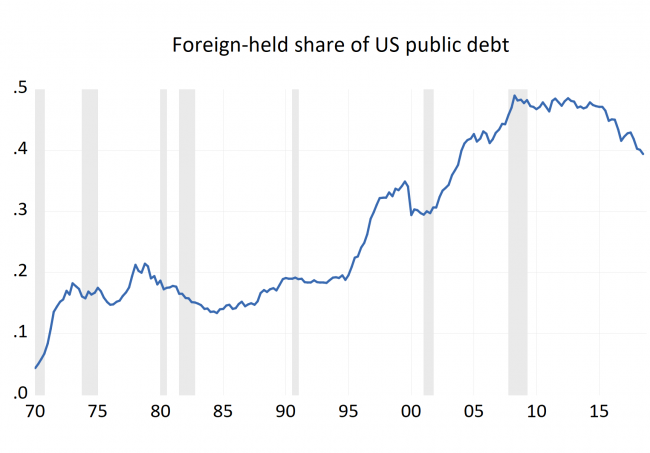 Share the post "Foreign holdings of US debt have been coming down a bit. Is that a problem?" 3 comments in reply to "Foreign holdings of US debt have been coming down a bit. Is that a problem?" Upon sale, where did this money go? If I were China I would use it to backstop their own Investments, not put it into the US led stock market. If I wanted to weaken control of the financial system by the US, that is. For instance, investing in an alternative payments system so the US dollar becomes less and less important to global transactions and credit systems. Trump is clearly NOT making the US great again, but instead he is undermining our strengths, including our reputation as a stable and honest broker and intermediary. Take Nick’s analysis another step and you see that the reason foreign Treasury holding have declined is because the current account deficit has been reduced. Maybe half ot the lower trade deficit is due to production and exports of fracked oil and gas — nothing that Trump did caused this.